We went and got ourselves a Firkin. About time. These little casks are great fun. We’re using ours to make bright, lightly sparkling, naturally conditioned brews. We’re also using it to experiment with a wide range of ingredients and flavors for special taproom releases. To wit, our release last Friday, where we poured plenitudes of orange and mango juice onto a base of our Nor’easter New England IPA. The result was an even more intense explosion of tropical fruit through an even softer and more pillowy mouthfeel. Yum. Though we’ve only just got our firkin, they have been around a very long time. They first emerged on the trading wharfs of London, about 500 years ago. 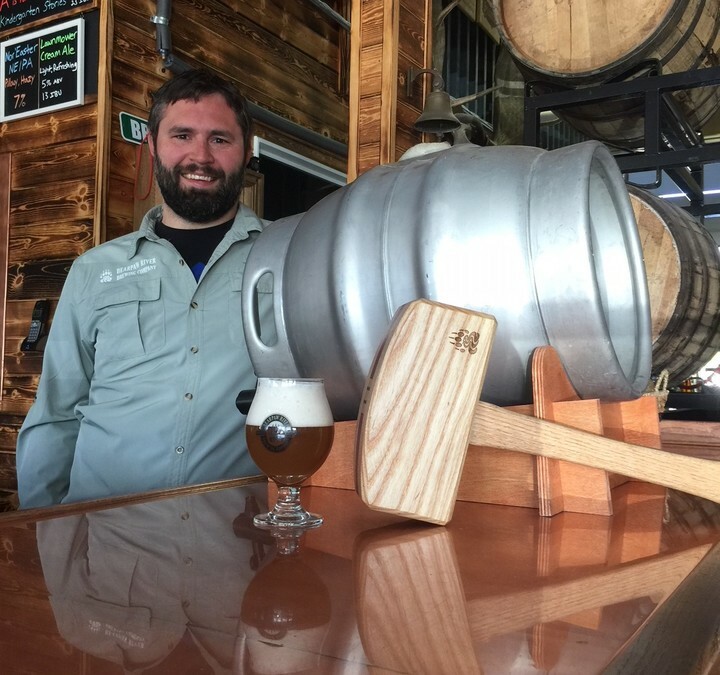 A firkin is a cask the size of 1/4 of a barrel. Hence the name, which derives from the Dutch vierdekijn, with vierde meaning “fourth,” or “fourth part,” and -kin meaning something like “little.” So a firkin is a “little quarter” of a barrel. In the old days of the English trading with those wily Dutch firkins were most commonly filled with beer. However, the earliest evidence of what was actually sold in a firkin, from 1480, tells us it was filled with salmon. Perhaps someday our brewers will dream up a cask-conditioned smoked salmon porter as a tribute to this first firkin use, but that remains to be seen. If you would like to try it, perhaps have a quiet word with Jake or Damian. What else went into firkins? Butter. Lots of butter. But also other fish, namely herring and eels. (BTW, can you imagine popping open a firkin packed full of cold, slimy eels?) Firkins were also filled with mead and wine, no doubt when beer was unavailable, and they were also loaded with all manner of dry goods including soap and gunpowder (the kind of stuff you definitely CANNOT get wet). Still, the connection with beer has endured the longest, resurging of late in the Real Ale movement in England, and in the current craft beer scene in the US. One thing about firkins is that, unlike the modern steel keg, it is literally “tapped.” Brewers use a soft bung to plug a hole near the base of the vessel. When the beer is properly conditioned, and at the right temperature, a barkeep will hammer a serving tap into the hole to replace the bung and allow the beer to flow. 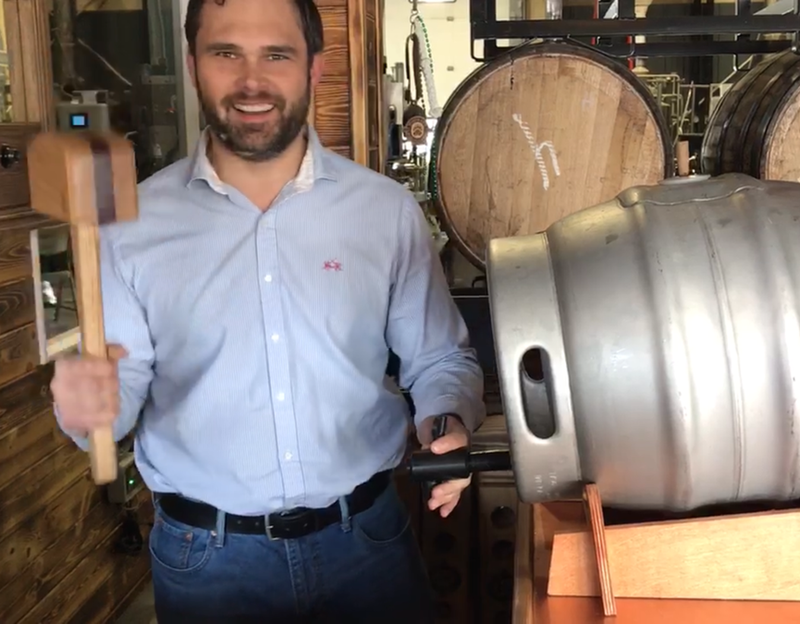 If the carbonation (and therefore pressure) inside the firkin is as it should be, it takes some force to dislodge the bung, and for this reason tapping a firkin traditionally involves the use of a heavy mallet. Thankfully our woodworker-in-chief, Jack, has been hard at work on our custom ceremonial firkin-tapping mallet. He made it of ash and purple heart. In the mallet’s head he drilled holes for 140 pennies – the extra weight adding a little more oomph to the swing. At least, Jack said, the mallet is now worth $1.40. The game plan moving forward is to put some road miles on this ceremonial mallet, and to fill up our firkin with new and interesting brews. With the firkin’s rich and illustrious past, we have a lot of catching up to do.